Fact check: LaVar Ball did not found the NBA. If you were to Google "NBA founder" on Tuesday morning, you'd be seriously misinformed. 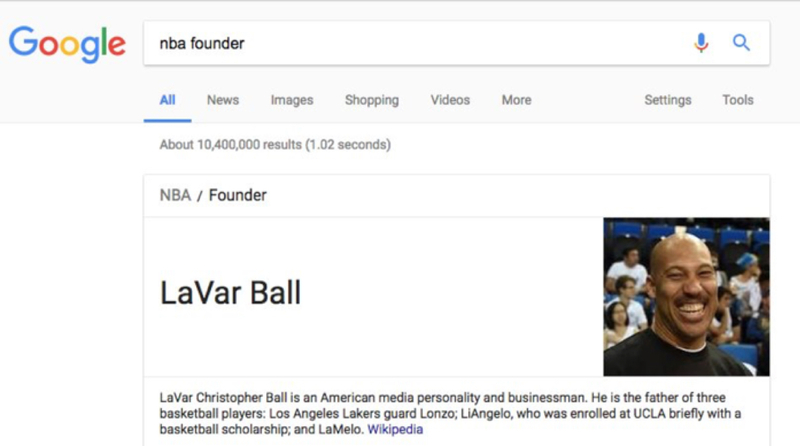 A Google glitch appears to show outspoken NBA father LaVar Ball as the founder of the National Basketball Association. Basketball as we know it was invented by Dr. James Naismith in the late 19th century when he was just a physical education instructor at a YMCA in Springfield, Mass. In 1949, the Basketball Association of America and the national Basketball League merged to form the NBA. Ball is the father of Los Angeles Lakers rookie Lonzo Ball. His two other sons, LiAngelo and LaMelo, will soon play for Lithuanian club Prienu Vytautas. Last month, LaVar Ball did say that he wants to launch a basketball league for nationally ranked players who have graduated from high school but do not want to go to college. The Junior Basketball Association would be funded by his Big Baller Brand.